Our organization must be effective. The sense of despair many of us feel is grounded in the reality of an ascendant far right. Right now they face little resistance. The sense of urgency many of us have felt is a recognition of the need to build that resistance. It is time for us to take up that task, to find new comrades ready to fight and to fight. No one is coming to save us- we cannot use the electoral system to fight the right effectively. It is time to stop waiting and defend each other in the streets. We should not fool ourselves. These are not ordinary times. The election of Donald Trump signals a full scale assault by the state on Muslims, immigrants, the LGBTQ community, women, and many other people. The environment and the social safety net are going to come under increased attack. Problems like police violence and imperialism abroad are going to get worse. What is even more troubling is that the most racist and violent groups in our society are already emboldened by the election to strike out violently at people in our communities. This is not an abstract or hypothetical problem. People are being verbally and physically assaulted in our area right now and it is only likely to get worse. People have been killed by Nazis in our community (in 1993), Nazis have come to Olympia to organize in support of police violence (May 2015), more recently a white supremacist assaulted an interracial couple with a knife (August 2016). We have an active militia movement in the South Sound region. None of this is going to get better under President Trump. The situation we find ourselves in demands an effective response. We need to come together and we need to be more militant and better organized than in the past. If our response is effective we can count on even more wrath and repression from the state and the far right. We can either choose to be victims or we can develop mechanisms for community self-defense. Fortunately, a model to organize against all of this already exists. The IWW’s General Defense Committee has existed since 1917, with the purpose of providing defense and relief to people persecuted for fighting the oppression of the working class. More recently, the Twin Cities IWW has refined the GDC concept by drawing on the example of the Black Panther Party for Self-Defense to develop a Community Self-Defense based organization within their city that strives to go beyond mere organization for physical self-defense and confrontation to provide tools, institutions, and programs necessary to increase the resilience, autonomy, and fighting spirit of their community. Other IWW branches have also formed GDC locals to follow this example. Twin Cities GDC also has working groups that do legal defense, Copwatch, tech security, picket training, antifa/intel work, harm reduction based drug addiction remediation, sexual assault victim and survivor support, martial arts training, coordination of solidarity with other groups, and long term strategic planning. A core strategy is building capacity for resistance and self-defense across their whole community by offering skills trainings open to anyone who supports their goals. Working within the IWW gives Twin Cities GDC infrastructure that allows for networking and resilience. 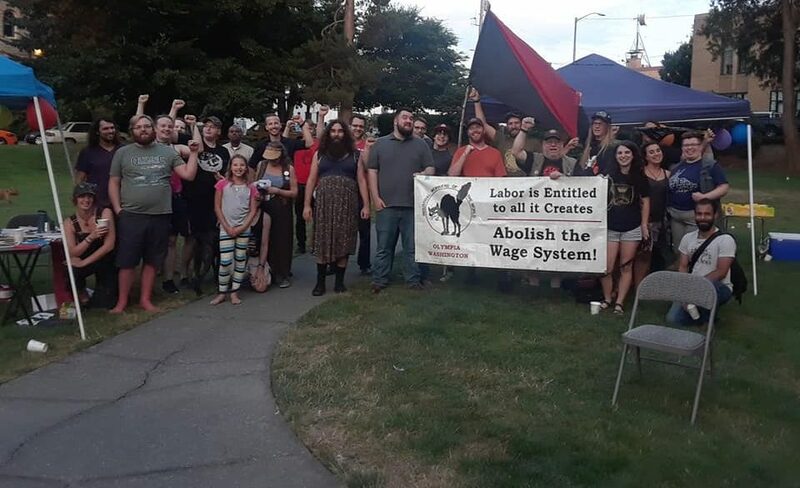 The IWW is dues and membership based organization with thousands of members across the world in General Membership Branches in dozens of cities. This provides GDC Locals with logistical, financial, other support, and the ability to effectively network. More importantly, it provides continuity between struggles. An individual crisis may pass, but the IWW has been around for over 100-years. It isn’t going to blow away when things cool down. This allows GDC locals to build capacity for more effective resistance over time. Any community would benefit from having a GDC local under normal circumstances. The rise Trumpism and the resurgence of white nationalism and the far right makes it clear we have to be more organized and more effective than we have been in the past. We need to build solidarity and capacity across our movements in order to support groups in our community being targeted by bigots and state oppression. Building a GDC local in the Olympia area right now is an excellent way to make that happen. Our Olympia IWW general membership branch has already taken all the steps necessary to form our own GDC Local. Over the next several weeks we will be beginning our organizing campaign by reaching out humbly to other community based organizations already struggling against oppression in our area in order to find out how they would like us to most effectively support their ongoing efforts. We will also be looking for the best ways to organize to support the sanctuary movement, help empower vulnerable groups to feel safer in our community, fight fascism and white nationalism, build capacity and skills across our movements, and spread anti-oppression analysis among the white working class. If you are ready to take up the fight let us know. Email OlympiaIWW@riseup.net, message us at https://www.facebook.com/olyiww/, or call 360-362-0112 and leave a message. Together we can create a horizontal organization that will fight for targeted people, the working class, and help build a better world.